Accessories are the details that bring a room to life, reflecting the personalities of the people who inhabit it. Accessories transform a room. To decorate your home, don't be shy about changing them. They express your spirit in this room, so keep it lively. Have a little fun. Changing accessories with the seasons or festive times can bring comfort and variety to a room. This week we feature a small, simple apartment, with very casual furniture. The whole house is very cozy and good looking. 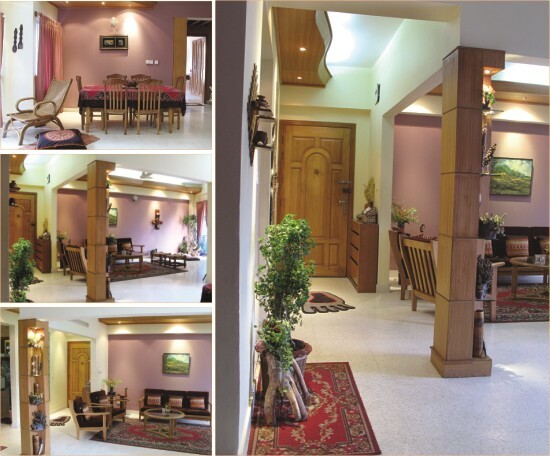 The dining space, living room and foyer's corridor are in an open space. With minimum space, the open theme works best. The narrow corridor is allocated for the foyer. We installed a sleek false ceiling to demarcate this area, and a thin cabinet made for shoes. In the spacious living area, we placed a simple but elegant sofa set for sitting, and two small leather sitters in another corner. Since the homeowner loves plants and handicraft products, we also arranged some dry tree roots and a bunch of plants in a corner of the living room. On the other side we placed a cane lamp and clay pots. All the accessories are very simple and locally handmade products. But all are very artistic. They can be exquisitely simple objects from nature or the product of human ingenuity and artistry. 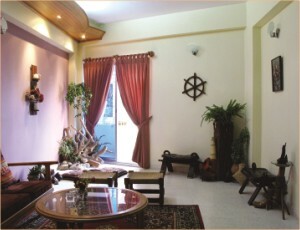 To decorate your house, you don't have to purchase expensive foreign accessories. Sometimes eco-friendly handmade objects create the desired effect way better. Our indigenous artisan goods have that rich, timeless appeal. We placed a simple dining table in the dining space. A batik printed tablecloth adds colour to the area. The lovely TV corner area is made striking with an old rocking chair placed at a rakish angle to the simple retro television set. 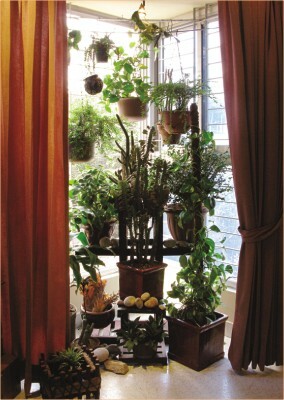 A bunch of small fresh green plants are placed in the shelves, while others are suspended from the ceiling. An pillar in the middle of the room creates a visual obstacle, but at the same time, is a structural necessity. To make the most of a necessary evil, we covered the pillar and made some open shelves for decor pieces. We also attached spotlights in the pillar to better display the lovely green cactus and some small decor pieces, which include ingenious craft objects made by children, as well as small pottery, to bring a sweet nostalgic mood. A floor can be made warmer and more inviting with jute carpet or wool rugs. 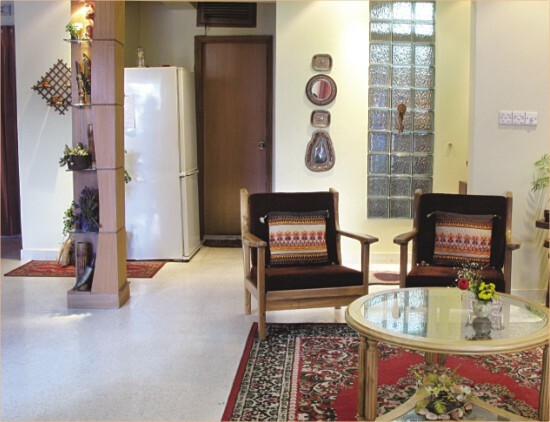 We placed jute carpet in the living area, and used handloom, cotton fabrics for curtain. Lighting is also very important for any space. Simple indirect lighting from the sleek false ceiling and spotlight effects turn the area bright. 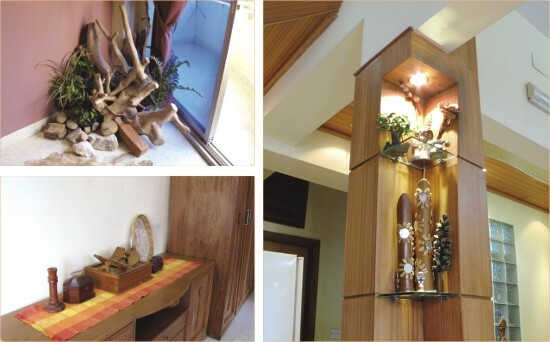 Your home can be softened or enhanced with accessories. Bring new texture, colour and accessories. The sweet little home is looking fabulous with its rocking chair, cushion and shelves with fresh flowers and botanicals.